The strange holes in the earth found in the northern tundra on Russian territory in July could mean the beginning of irreversible changes in the climate of our planet. According to Russian scientists, the most likely reason for the formation of such holes is the emission of natural gas, which may be caused by global warming. Over the last month, two strange holes have mysteriously opened up in tundra of the Yamalo-Nenets Autonomous Area (YNAO) in the Russian Arctic, causing great excitement among Russia’s scientific community. Researchers are now examining the giant holes in a bid to discover the reason for their sudden appearance. 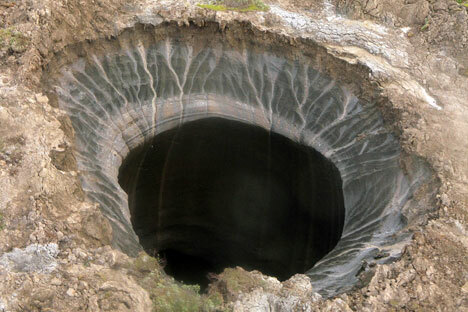 According to geologist Konstantin Ranks, the emission of natural gas that scholars consider the most likely explanation for the formation of the holes may be a consequence of global warming. Glaciologists from the sub-Arctic research and study unit in Tyumen say that permafrost temperatures are rising steadily in the region of the Bovanenkovskoye gas field on the Yamal Peninsula in the Russian Arctic, near where the first hole was discovered. Forty years ago it was on average about eight degrees below zero, but now in certain areas it is only minus three. “Perhaps this is precisely why the process of releasing methane from crystalline ice traps started in the depths of the northern tundra,” wrote Ranks in an article published by the Slon.ru website. The second large funnel to appear in the last month was discovered in the Yamalo-Nenets Autonomous Area on 21 July, and the finding was subsequently announced on the Rossiya 1 television channel. The hole has a diameter of approximately 15 meters and snow is visible inside it. The ongoing lack of a clear explanation for the appearance of craters such as this has led to the discussion of various fantastical theories on social networks, from the testing of unknown weaponry to underground alien bases. News of the crater was first spread by local reindeer herders, who said a celestial body had fallen and then a flash had occurred on 27 September 2013 in this region (56 miles from the village of Antipayut). A different reindeer herder only said that he saw smoke, haze, and then a flash. Specialists from the Center for the Study of the Arctic and the Institute of the Earth Cryosphere have been studying the first crater since 16 July. They measured its radiation background and concluded that there is no dangerous radiation there. Scholars noted that pieces of earth were scattered near the crater and at a distance of 328-394 feet, which indicates that rather than collapsing, rock was in fact ejected. Moreover, traces of charring, scorching, or any other evidence indicating a thermal explosion have not been found, so the possibility of a meteorite can be ruled out. Scientists believe that the frozen earth was smashed outwards by powerful pressure from below; so-called swamp gas can act in a similar fashion. The video clip depicting the first crater near the village of Bovanenkovo appeared on the internet on 10 July. The recording immediately attracted the attention of the public (at the moment the total number of views of various videos about the craters that have been found has reached several dozen million). Drawn from material found at Slon.ru, Lenta.ru and Rossiyskaya Gazeta.